i love blosxom's static rendering mode, my hardware is ancient and slow. the available plugins are quite borken, though: in the last 36hrs i've submitted about 4 bug reports and rewritten two modules from scratch (think positive: that is possible at all). 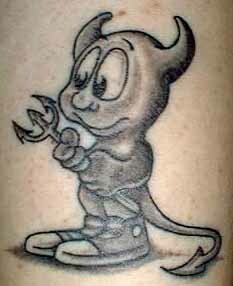 ...and the daemon is my good-luck charm which I have with..ahem, on myself all the time. The Guru levitation status is what I aspire to. Check out userfriendly's daemon series: day one, day two, day three, day four, day five and (IMHO the best) day six. SNAFU is an acronym from the WWII-era that stands for "Situation Normal, All Fucked Up". I think this describes my life and the computers around me way too often to be a coincidence. More about SNAFU & co can be found in the Jargon File.